If you could go anywhere, and we mean anywhere, where would you choose? A new survey suggests that your answer may well be Norway to see the Northern Lights – Mother Nature’s very own psychedelic light show. 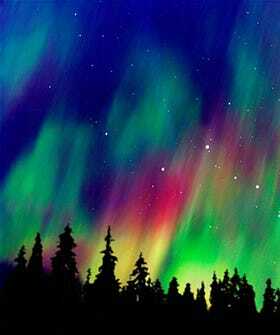 The phenomenon in the sky, also known as Aurora Borealis, took the top spot as the travel experience Britons would most like to see before they die. Yes, die. According to research conducted by TravelSupermarket, there is a trend among us Brits to make travel bucket lists – places we want to visit before we pop our clogs. No, we weren’t aware this was a thing either, but, according to The Telegraph, it most certainly is. And, chances are if you’re over the age of 30, you already have one: “The research also showed that with the average age of drawing up a Bucket List now 32, many British travelers are setting their minds to what they want to see before they die at an age when they can give themselves a decent chance of doing so.” Doesn’t exactly give you wanderlust, does it?